The Legal Genealogist is on the road again. In Grand Rapids, Michigan, to be precise, for tomorrow’s Got Ancestors?! 2017 seminar of the Western Michigan Genealogical Society. We’re going to have a lot of fun tomorrow at the Grand Rapids Salvation Army Kroc Center, talking about DNA and copyright and lots and lots of tips on how to do genealogy right… Walk-ins are welcome; you’ll need to bring your own lunch. So come on out and join us. In the meantime, of course, I’m doing my usual review of local laws… and finding some neat stuff in the one of the oldest of Michigan’s chartering documents. But it was that Constitution of 1835 that served as the governing vehicle to get Michigan admitted… and it’s got some interesting provisions. Voters were the usual white male citizens over the age of 21 years, resident in the state for six months,10 but they had some special protections. Now… look… I know I’m a law geek. So I find this stuff cool all by itself. But for those genealogists who have some trouble understanding why I think this is quite so cool… stop and think. Think of the records created as the result of this one document. The records of the governors. 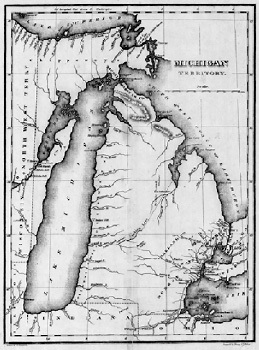 Image: “Michigan Territory,” in James Finlayson, A Complete Historical, Chronological, and Geographical American Atlas (Philadelphia : Carey and Lea, 1822); reproduced by Michigan State University Libraries, Scanned Maps. Than you Judy, for a wonderful, entertaining, and fun lectures on a dark, dreary, wet Saturday at “Got Ancestors ’17’, Looking forward to seeing you at the NGS conference in June 2018, the second one I will attend and the first in Grand Rapids and Michigsn.